America’s Cup in Danger! And Now the F1? Oh man, would you guys just decide already?! The Swiss team Alinghi, current holders of the America’s Cup, and Oracle/BMW are headed back to court yet again. This is like watching spoiled rich kids fight over who gets to ride on the pony first. We’ve lost track over who said what, and the accusations and recriminations being thrown around. The only thing which seems certain is that the big loser will be Valencia. There’s still no guarantee that the competition will be held here at all. My feeling is Valencia should just withdraw any effort to get the America’s Cup here. It’s turning into an expensive drama that the city ultimately has no say in. Let the world’s wealthy elite have their playground somewhere else! The harbor could be better used for other things. Granted, we don’t know much about sailing and weren’t here for the 2007 edition… what do you all think? And as if the possible loss of the America’s Cup isn’t enough bad news, the local paper here recently published an article titled “¿Adios a la Fórmula 1?” The financial crisis and last year’s roundly criticized inaugural Grand Prix are combining to throw doubt on the future of the race in Valencia. It’s just rumor at this point, but the loss of the F1 would be terrible news for the city. Instead of sporting events for the elite, wouldn’t the city’s money have been better invested in rehabilitating the downtown? 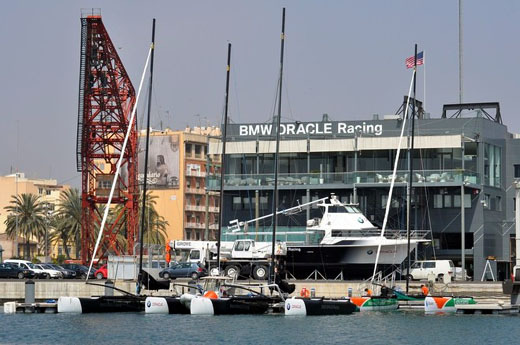 Valencia will do everything to host the America’s cup just because it’s a great business! I am biased since I work in tourism and want both to continue, but I think the America’s Cup is worth much more money than the F1. 1000s of people have lived here for 5 years now. Thousands more lived here for 2 to 3 years before the last Cup. The event itself played out over months not just a weekend. Now that the money was spent to build it and the site is there it would be a great plus for the city to have it here again. Alinghi controls the location no matter what. If it is 1 on 1 with BMWOracle it could be just 2 out of 3 and not a big money maker. If by some stroke of luck it is a full Cup next year it would be great for the city.